This article focuses on the features of myelodysplastic syndromes (MDS) associated with isolated del(5q) as they relate to pathology. MDS with isolated del(5q) is one of a group of clonal disorders of myeloid stem cells that are characterized by ineffective hematopoiesis, manifested in morphologic dysplasia of hematopoietic precursors and characterized by one or more peripheral blood cytopenias. In patients with MDS with isolated del(5q), the morphologic dysplasia is most evident as an increase in the number of small, hypolobated megakaryocytes, as seen in the following image. Normocellular bone marrow with increased numbers of small, hypolobated megakaryocytes. 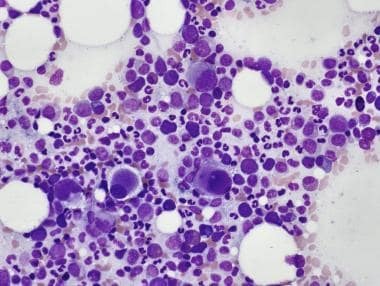 In this case, granulocytes and erythroid precursors show normal maturation (bone marrow aspirate, Wright-Giemsa, ×1000). Del(5q) is one of the most frequent abnormalities identified in MDS,  including many cases of MDS associated with previous chemotherapy or with other cytogenetic abnormalities. In cases in which the patient has received previous chemotherapy, MDS in which del(5q) is the sole abnormality should be classified as a therapy-associated myelodysplastic syndrome (t-MDS). The prognosis for patients with t-MDS is not as favorable as the prognosis for patients with MDS with isolated del(5q). If additional cytogenetic abnormalities are present and the patient has no history of chemotherapy, the disease should be classified on the basis of morphologic parameters. As with other forms of MDS, MDS with isolated del(5q) is predominantly a disease of elderly persons; the median age of patients at the time of presentation is between 65 and 70 years. As described in van den Berghe et al's original series  and as defined by the World Health Organization (WHO) classification of tumors of hematopoietic and lymphoid tissues,  MDS with isolated del(5q) is more common in women. See also Pediatric Myelodysplastic Syndromes Pathology, Pathology of Acute Myeloid Leukemia With Myelodysplasia-Related Features, Pathology of Therapy-Related Myeloid Neoplasms, Pathology of Other Myeloid Related Precursor Neoplasms, and Pathology of Acute Myeloid Leukemia Not Otherwise Categorized. Patients with MDS with isolated del(5q) present with a striking macrocytic anemia and usually have normal or increased numbers of platelets in the peripheral blood. Leukocytopenia may be present; however, the number of granulocytes is typically normal. Bone marrow aspirates show predominantly megakaryocytic dysplasia with many small, hypolobated megakaryocytes (see the images below). Small, hypolobated megakaryocytes are typical of myelodysplastic syndrome with isolated del(5q) (bone marrow aspirate, Wright-Giemsa, ×1000). Normocellular bone marrow with trilineage hematopoiesis, including many megakaryocytes. 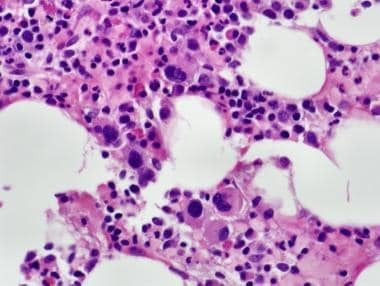 Scattered hypolobated forms are present (bone marrow biopsy specimen, hematoxylin-eosin, ×1000). Erythroid hypoplasia may be present. Erythroid and granulocytic dysplasia, if present, is generally mild. The bone marrow biopsy and clot sections generally show normocellular or mildly hypercellular bone marrow with numerous small megakaryocytes, sometimes forming clusters. 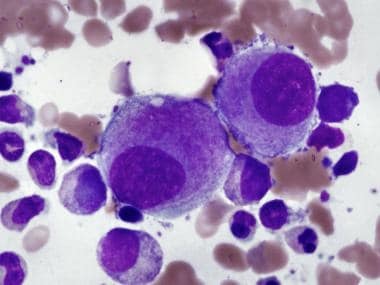 Although some early series included patients with blast counts greater than 5%,  such cases are better classified as either refractory anemia with excess blasts (5-19% blasts) or acute leukemia (20% or more blasts). There are no specific immunophenotypic findings associated with myelodysplastic syndrome (MDS) with isolated del(5q). However, immunohistochemical studies that assess for the presence of CD61 or factor VIII on bone marrow core biopsy specimens or clot sections may reveal the small, hypolobated megakaryocytes associated with this disease. Immunohistochemical studies for CD34 should reveal that few (less than 5%) mononuclear cells are immunoreactive. Flow cytometric analysis may be of value in establishing a diagnosis of MDS. However, its utility in specifically establishing a diagnosis of MDS with isolated del(5q) has not been demonstrated. As its name implies, in cases of myelodysplastic syndrome (MDS) with isolated del(5q), cytogenetic studies demonstrate a deletion of the long arm of chromosome 5 (del(5q)) as the sole cytogenetic abnormality. In patients with myelodysplasia, deletions of 5q show considerable heterogeneity. Several genes localized to the long arm of chromosome 5q influence hematopoiesis and could be involved in the pathogenesis of the syndrome. In addition, the use of the immunomodulatory drug lenalidomide (an analogue of thalidomide) has shown promise in the treatment of MDS, particularly MDS with del(5q). [14, 15, 16] Benefits were seen in patients with del(5q) as the sole abnormality, as well as in patients with del(5q) in association with other cytogenetic abnormalities. In over half of the patients with MDS with del(5q) who were treated with lenalidomide, transfusion independence was achieved, and a subset of patients exhibited a complete cytogenetic response. A study by Mallo et al revealed the importance of a low baseline platelet count, karyotypic complexity and TP53 mutational status for response to lenalidomide treatment. The authors added that this study supports the molecular study of TP53 in MDS patients treated with lenalidomide. For patients with forms of MDS other than MDS with del(5q), response rates were lower. Additional studies with longer follow-up are needed to determine how this treatment affects overall survival. Hasserjian RP, Le Beau MM, List AF, Bennett JM, Thiele J. WHO Classification of Tumours of Haematopoietic and Lymphoid Tissues. Swerdlow SH, Campo E, Harris NL, eds. Myelodysplastic syndrome with isolated del(5q). 4th ed. Lyon: IARC Press; 2008. 102. Sebaa A, Ades L, Baran-Marzack F, Mozziconacci MJ, Penther D, Dobbelstein S, et al. Incidence of 17p deletions and TP53 mutation in myelodysplastic syndrome and acute myeloid leukemia with 5q deletion. Genes Chromosomes Cancer. 2012 Dec. 51(12):1086-92. [Medline]. Sole F, Espinet B, Sanz GF, et al. Incidence, characterization and prognostic significance of chromosomal abnormalities in 640 patients with primary myelodysplastic syndromes. Grupo Cooperativo Espanol de Citogenetica Hematologica. Br J Haematol. 2000 Feb. 108(2):346-56. [Medline]. Santana-Davila R, Holtan SG, Dewald GW, et al. Chromosome 5q deletion: specific diagnoses and cytogenetic details among 358 consecutive cases from a single institution. Leuk Res. 2008 Mar. 32(3):407-11. [Medline]. Van den Berghe H, Cassiman JJ, David G, Fryns JP, Michaux JL, Sokal G. Distinct haematological disorder with deletion of long arm of no. 5 chromosome. Nature. 1974 Oct 4. 251(5474):437-8. [Medline]. Van den Berghe H, Michaux L. 5q-, twenty-five years later: a synopsis. Cancer Genet Cytogenet. 1997 Mar. 94(1):1-7. [Medline]. Mohamedali A, Mufti GJ. Van-den Berghe's 5q- syndrome in 2008. Br J Haematol. 2009 Jan. 144(2):157-68. [Medline]. Holtan SG, Santana-Davila R, Dewald GW, et al. Myelodysplastic syndromes associated with interstitial deletion of chromosome 5q: clinicopathologic correlations and new insights from the pre-lenalidomide era. Am J Hematol. 2008 Sep. 83(9):708-13. [Medline]. Washington LT, Doherty D, Glassman A, Martins J, Ibrahim S, Lai R. Myeloid disorders with deletion of 5q as the sole karyotypic abnormality: the clinical and pathologic spectrum. Leuk Lymphoma. 2002 Apr. 43(4):761-5. [Medline]. Boultwood J, Fidler C, Strickson AJ, et al. Narrowing and genomic annotation of the commonly deleted region of the 5q- syndrome. Blood. 2002 Jun 15. 99(12):4638-41. [Medline]. Ebert BL. Deletion 5q in myelodysplastic syndrome: a paradigm for the study of hemizygous deletions in cancer. Leukemia. 2009 Jul. 23(7):1252-6. [Medline]. Ebert BL, Pretz J, Bosco J, et al. Identification of RPS14 as a 5q- syndrome gene by RNA interference screen. Nature. 2008 Jan 17. 451(7176):335-9. [Medline]. Chen D, Hoyer JD, Ketterling RP, et al. Dysgranulopoiesis is an independent adverse prognostic factor in chronic myeloid disorders with an isolated interstitial deletion of chromosome 5q. Leukemia. 2009 Apr. 23(4):796-800. [Medline]. Giagounidis AA, Germing U, Haase S, Aul C. Lenalidomide: a brief review of its therapeutic potential in myelodysplastic syndromes. Ther Clin Risk Manag. 2007 Aug. 3(4):553-62. [Medline]. [Full Text]. Wu L, Li X, Xu F, Zhang Z, Chang C, He Q. Low RPS14 expression in MDS without 5q - aberration confers higher apoptosis rate of nucleated erythrocytes and predicts prolonged survival and possible response to lenalidomide in lower risk non-5q- patients. Eur J Haematol. 2013 Jun. 90(6):486-93. [Medline]. Mallo M, Del Rey M, Ibanez M, Calasanz MJ, Arenillas L, Larrayoz MJ, et al. Response to lenalidomide in myelodysplastic syndromes with del(5q): influence of cytogenetics and mutations. Br J Haematol. 2013 Jul. 162(1):74-86. [Medline]. Mallo M, Del Rey M, Ibáñez M, et al. Response to lenalidomide in myelodysplastic syndromes with del(5q): influence of cytogenetics and mutations. Br J Haematol. 2013 Jul. 162 (1):74-86. [Medline]. Kelaidi C, Eclache V, Fenaux P. The role of lenalidomide in the management of myelodysplasia with del 5q. Br J Haematol. 2008 Feb. 140(3):267-78. [Medline].